The 3D printing pen is one of the projects which aims to enable individuals and designers to visualize ideas in the 3D space. There are number of initiations to create a 3D printing pen using the simple technology of the 3D printer head to melt the plastic filament and create the desired object in the space. Part of these projects are the 3Doodler and LIX pen that we covered a while ago. The CreoPop is a new 3D printing pen initiation with unique features compared with the other pens on the market. The new CreoPop allows drawing in the 3D space inter alia and magnetic objects. The pen uses a stereolithography (SLA) 3D printing technology with photosensitive resin. The technology is based on a laser beam that goes through the resin material and turns it into a solid case. In the CreoPop, the UV laser turns the resin that moves from inside the pen into solid material. Unlike the other pens that uses melted plastic filament, the CreoPop does not get hot at the end of the tip area. This advantage makes it safe and easier to use especially for children who would like to experience 3D drawing in the space around them. Another advantage for the CreoPop is that it does not create any smell of melted plastic while working similar to the other plastic filament pens. Additionally, it is charged using a USB drive, so it doesn’t need any power cables and can be taken anywhere without the need to carry a charging cord. We strongly believe in the 3D printing sector. CreoPop specifically will not only bring this game changing technology to wider commercial applications, but also into households. I grew up using Lego blocks to make 3D objects. This generation will grow up using CreoPop. 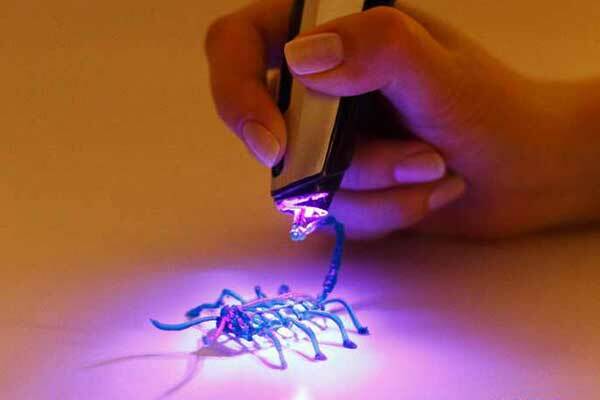 The new 3D printing pen represents an evolution in 3D printing technology as it changed the technique used in other 3D prints. Replacing the fused deposition modeling technology with stereolithography helped the manufacturers of the CreoPop to use different materials and experience materials with different features.